Interpretations of the Special Traits 'Talents' Number (Numerology Lesson 24) | Law of Attraction Plus: The Secret revealed! To refresh your memory, the Special Traits (talents) numbers are the numbers that that repeat an average or above average number of times in your name. Once again here is the chart that you will use to find the value equivalencies to the letters of your full name. Also for your reference here is the table that shows you what the average equivalence is for each number in a name. 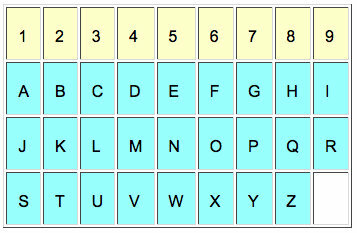 Simply count up the letters in your name and compare them to the chart above to figure out which of your equivalences is your average and/or above average numbers. Then refer to the interpretations below which tell you a lot about your more positives or exaggerated character traits and talents. Three 1's (average): You are a well-rounded individual of average intelligence who will have the means to take care of yourself in life. Four or more 1's (above average): You are strong-willed, assertive and possibly destined to be a leader. The more 1's in your name, the more tyrannical others will probably find your personality. One 2 (average): You are a cooperative and diplomatic individual who gets along well with others and who enjoys socializing. Two 2 's or more (above average): You are a charming, considerate and charismatic individual who is very well spoken. Your persuasive talents are considerable and you probably have a great appreciation for the arts. Two 3's (average): You express yourself in a normal, natural and heartfelt way. Your artistic talents are average. Three 3's or more (above average): Chances are that you possess an extraordinary talent of some kind. The more threes that are in your name the more multi-faceted or stronger your talents are. One 4 (average): You are a hard worker, disciplined and are blessed with common sense and the ability to develop long range goals. Two 4's or more (above average): Your work is probably your passion and it consumes most of your time. The more 4's that you have in your name the more likely you are to have a tendency towards rigidity, obsessiveness and workaholicism. Four 5's (average): You are an agreeable individual who is flexible and adaptable. However you also realize the value of having a strong home base or "roots." Five 5's or more (above average): You are likely to be a bit of a maverick who enjoys travelling and meeting people. If you have a lot of fives you may be easily distracted and often accused of having too many projects going at one time. Staying in one place bores you. 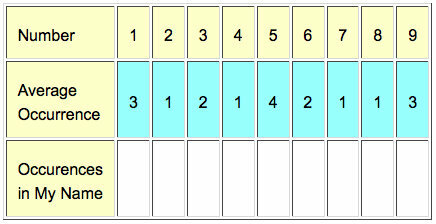 Two 6's (average): You are a nurturer and caretaker and have the normal urges to procreate and have a family. You are gentle and responsible provider. Three 6's or more (above average): You may be a strongly idealistic and stubborn individual who is a strict parent. The more sixes you have in your name the more likely you are to be fixed in your point of view when it comes to ethics and morality. Remember that in this lesson we have only been looking at the interpretations for the average or above average presence of numbers. In the next installment we will examine the meaning of a deficiency or no numbers in a name. One 7 (average): You possess an inquisitive, questioning mind, but you are not abnormally studious or curious. Your academic talents are probably well balanced. Two 7's or more (above average): The more sevens you have in your name the more brilliant academically you are likely to be. However a predominance of sevens can also mean being so smart that you do not relate easily to others. This number signifies academic, scientific and metaphysical achievement. One 8 (average): You are business-like, self-sufficient and more likely a follower than a leader. You have a natural acumen for numbers and are probably more well off then most people. Two 8's or more (above average): You have a natural talent for business and making money and are more than likely destined to be rich. The more 8's that you have in your name the more rich (and possibly famous) you are destined to be. Three 9's (average): You are a compassionate, tolerant and good-natured individual who respects humanity and the rights of others. You are an optimist. Four 9's or more (more than average): You are an idealistic individual who is probably generous and self-sacrificing to a fault. The more 9's you have in your name, the more likely you are to be perceived as a fanatic or religious extremist. 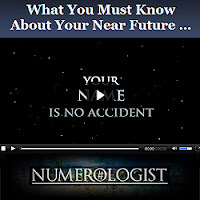 Nines in your name can also signify psychic talent. Keep in mind that in this lesson we have only discussed the Traits that are associated with the average and more than average presence of a number in the name. In the next lesson we will be giving you the interpretation for the Lesson numbers which account for lacking or missing values in a name.